Sean Dyche admits it has been one of the most difficult seasons in his managerial career. But while the job is not quite done yet, he praised his players for putting themselves in a position where they can effectively secure a fourth-successive Premier League campaign with victory at home to Cardiff City on Saturday. Burnley were in the bottom three at the halfway stage of the season, with a meagre 12 points. But they have since taken 24 from 14 games, to put them eight clear of the Bluebirds, who occupy the last relegation slot. 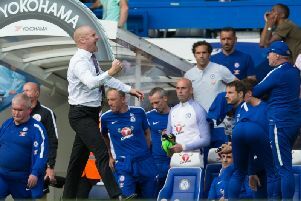 Asked whether it has been his toughest season, Dyche said: “Well, it’s certainly up there, but every season is tough for different reasons. Burnley’s results over the second half of the season would place them fifth in the form table, and Dyche is delighed with how his players have emerged from the fog. “If we all have that magic moment of knowing what we do, then in theory you wouldn’t have too many bad runs. I think the diligence to stick to the task from the staff to explain to the players the challenges of the first half of the season and how we correct that. “And the players deserve a massive amount of credit. “We have been very unfortunate with injuries but the players have looked beyond that and keep performing.